Plated steel privacy lock. Flip action to lock or unlock, no mortising required. Easy to install. Includes 1 lock and installation screws. Prefix U on factory number denotes new Defender Security packaging. Diecast painted housing with case-hardened steel bolt. Securely locks door in closed or ventilating position. 2-1/4"L x 1-1/16"W. Prevents sliding or lifting of door. Bolt 5/8". Includes 1 lock and 2 installation screws. Prefix U on factory number denotes new Defender Security packaging. Slide bolt surface mounts to face of door. Two keepers allow for surface or mortise frame installation. Includes (1) 1-1/4" surface keeper and (1) 9/16" x 1-5/8" mortise keeper. Prefix U on factory number denotes new Defender Security packaging. Slide bolt surface mounts to face of door. Two keepers allow for surface or mortise frame installation. Includes (1) 1-1/4" surface keeper and (1) 9/16" x 1-5/8" mortise keeper. Prefix U on factory number denotes new Defender Security packaging. Slide bolt surface mounts to face of door. Two keepers allow for surface or mortise frame installation. Includes (1) 1-1/4" surface keeper and (1) 9/16" x 1-5/8" mortise keeper. Prefix U on factory number denotes new Defender Security packaging. Slide bolt surface mounts to face of door. Two keepers allow for surface or mortise frame installation. Includes (1) 1-1/4" surface keeper and (1) 9/16" x 1-5/8" mortise keeper. Prefix U on factory number denotes new Defender Security packaging. Designed to secure doors, cabinets, casement windows, etc., in a vertical or horizontal position. Furnished with both universal and mortise strikes. Surface mount, no mortising required. Can be used in either vertical or horizontal position. Extruded brass bolt and case, solid brass strike. Protective clear lacquer coating. Mini-pack bagged. 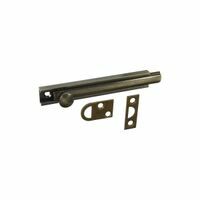 National Hardware Flush Bolt, Series: MPB1922, 4 in Bolt Length, Surface Mounting, Solid Brass, Antique Bronze, Includes: Universal and Mortise Strike, For Doors, Cabinets and Casement Windows Great for outdoor use, on doors that are located in harsh conditions, or any door requiring a high quality security door bolt. Includes angle and mortise strikes. UL Listed.